PARADISE, NL--(Marketwired - November 10, 2015) - HouseMaster, the first and most experienced home inspection franchise company in North America, recently honored Fred Holwell of the local Paradise, NL franchise with the Market Penetration Award at the company's annual conference held October 2 - 4 at the Wyndham San Antonio Riverwalk Hotel in San Antonio, Texas. The Market Penetration Award is given to the franchise that exceeds expectations at every turn from the first phone call to the downloaded inspection report and has the largest home inspection market share of their area. "This is a hard-won award," said Kathleen Kuhn, President of HouseMaster. "What Fred has shown us is that you don't need a large territory to do big business. He is a leader in the HouseMaster community and is always willing to mentor new Owners and cultivate new ideas for better business. This is the 13th year in a row that he has won this award. He is not only hard-working, but committed to being the best in the business." At this year's HouseMaster Conference, staff and franchisees attended sessions on best practices in hiring, reporting, and business management and were brought up to date on the latest developments in topics as diverse as local office marketing to drone technology. 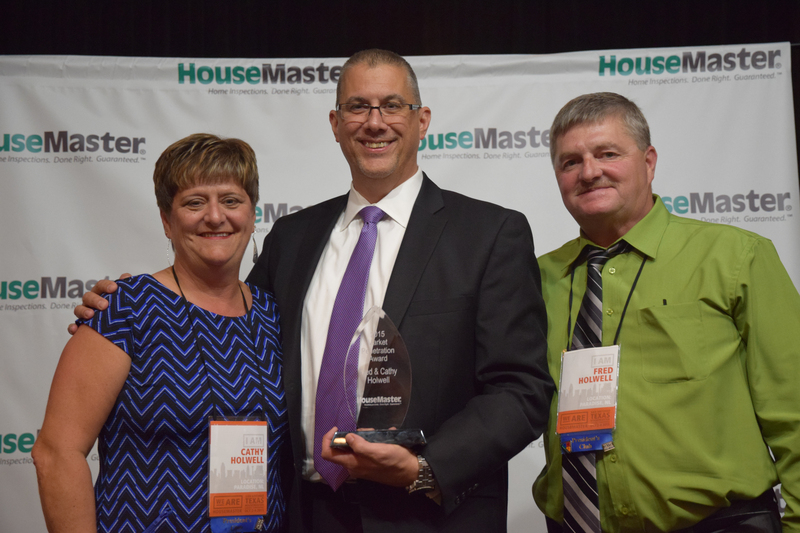 "Each year, the award ceremony at our conference recognizes deserving individuals for their sales and business success, as well as their commitment to the principles of the HouseMaster brand," said Kathleen Kuhn, President of HouseMaster. "This year's conference theme -- We Are HouseMaster -- was chosen to celebrate the professionalism and commitment of our entire HouseMaster family. Fred is an exceptional example of the driving force behind HouseMaster's success -- a passion for excellence." As a HouseMaster Owner, Fred provides home buyers and sellers an independent, third-party, professional evaluation of the condition of the major elements of a home. The guaranteed inspection enables potential home buyers and sellers the opportunity to make educated real estate decisions. From interior systems such as plumbing and electrical to exterior components like the roof and siding, the HouseMaster Home Inspection includes the evaluation of all visible and accessible elements of the home. Founded in 1979 and headquartered in Ewing, N.J., HouseMaster is the oldest and one of the largest home inspection companies in North America. With more than 365 franchised areas throughout the U.S. and Canada, HouseMaster is the most respected name in home inspections. For over 35 years, HouseMaster has built upon a foundation of solid leadership and innovation with a continued focus on delivering the highest quality service experience to their customers and providing HouseMaster franchisees the tools and support necessary to do so. Each HouseMaster franchise is an independently owned and operated business. HouseMaster is a registered trademark of HouseMaster LLC. For more information please visit www.housemaster.com or call 800-526-3939. 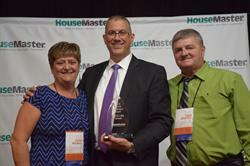 HouseMaster National Director of Marketing and Franchise Growth, Paul Ferrara with Franchise Owners, Kathy and Fred Holwell.